As the preparations for the concert continue apace (we’ve worked out a set list and everything) I’ve started making available the sheet music for free PDF download. There’s around twenty tunes there so far, so please take a look. Just go to http://www.jackhylton.com and click on ‘sheet music’. It’s free, which is nice, but if you want to contribute to the costs of undertaking such a mammoth task, then feel free to give me money! I’ve also started a service whereby I’ll print and bind the arrangements for you and post them, for a small cost. It’s relatively cheap for what you’re getting, but I don’t mind if you just download them! 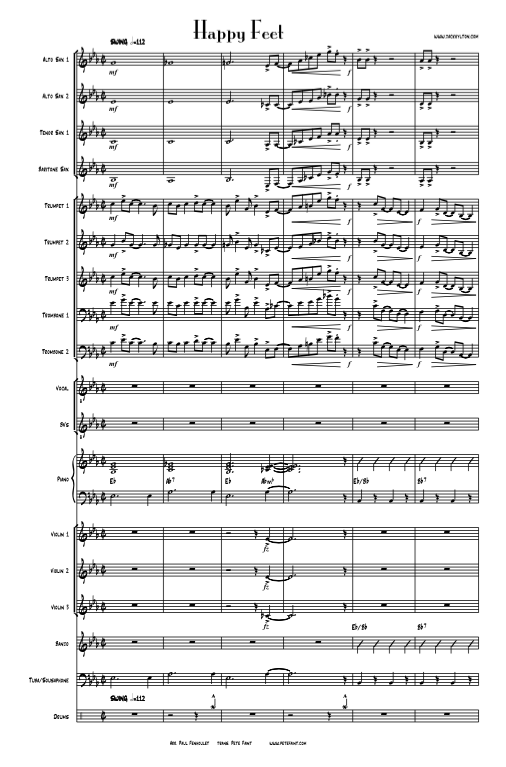 Anyway, please visit the site, download the sheet music and let me know how it all sounds! Please buy tickets, we’d love to see you there! Thought I’d share the rather extraordinary remix of Hylton’s version of Happy Feet. It was commissioned by Baz Lurmann for his album Something For Everybody. It’s remixed by Paul Mac and mixed by Blam, and whilst I’m not that old, and know lots about lots of different kinds of music, I don’t know what that means! Anyway, I kind of like it, and I suspect somehow or other, I’ll use it in the concert next year. In the meantime, open you ears and your mind, and don’t just dismiss it as being rubbish! It’s ace!